MONTREAL -- A Quebec woman who was allegedly killed by her husband as she suffered from advanced Alzheimer's had told family she didn't want to end up like their mother, who also had the disease, a jury heard Thursday. Johanne Lizotte took the stand Thursday in defence of Michel Cadotte, who is charged with second-degree murder in the death of her sister, Jocelyne Lizotte. Jocelyne Lizotte was 60 and in the late stages of Alzheimer's disease that had left her unable to care for herself and detached from reality. She was found dead in her bed at a Montreal long-term care facility on Feb. 20, 2017. Johanne Lizotte told jurors their mother had Alzheimer's and died in 2005. She said her sister confided in her on numerous occasions that she didn't want to end up in the same state. "I can tell you my sister told me repeatedly while my mother was still ill that she did not want to lose her dignity, that she would rather die than stay like our mother was -- the loss of dignity," she testified. Johanne Lizotte said she didn't know if her sister had signed a mandate in the event she became incapacitated. 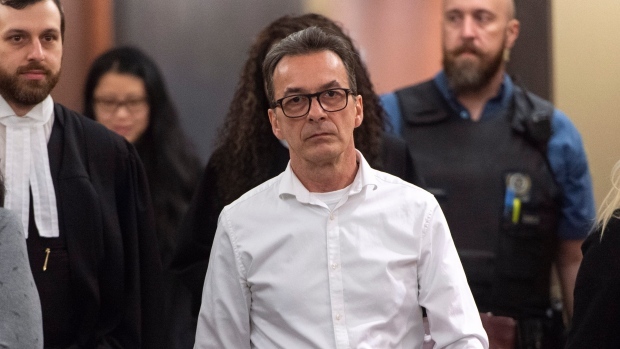 She was one of a handful of witnesses to take the stand as Cadotte's lawyers began mounting a defence that will include testimony from the accused. Lawyer Nicolas Welt told jurors in an opening statement that the defence won't dispute the essence of the evidence heard to date. It will argue that he cannot be held responsible for the killing because of his state of mind at the time. "Why did all this happen?" Welt asked. "Mr. Cadotte will explain how he lived with this from within." Welt said a psychiatrist and a psychologist will take the stand as well as Lizotte's and Cadotte's sisters, who testified Thursday. "We plan to demonstrate the Crown cannot under the circumstances meet its burden, and the state of mind of Mr. Cadotte and his intentions do not support a conviction for murder," Welt said. "All of this will reveal that on Feb. 20, Michel Cadotte was pushed to the end of his limits, and in that state of mind, he didn't have the freedom of choice." A subdued Cadotte, 57, listened to testimony while awaiting his turn on the witness stand. Johanne Lizotte said the couple always showed each other a lot of love -- something Cadotte continued even after illness ravaged his wife, and she wasn't able to communicate. "He always had something for her -- a bottle of champagne to celebrate their anniversary or her birthday," Johanne Lizotte said. "She always had flowers, cake or a piece of chocolate." She told jurors the illness in her sister seemed to take hold quickly. At their father's funeral, Jocelyne Lizotte's behaviour was out of character: She was laughing and couldn't stay still. "It was definitely a sign," she said. Johanne Lizotte described the last time she saw her sister at home before her hospitalization. "It was hell, I've never seen my sister walk so much in one day, she kept dropping her underwear," she recounted. "She was really not herself, she had no idea what she was doing." Her health situation deteriorated quickly and soon she was having trouble walking, eating or getting dressed on her own. "In a matter of time, she was in a wheelchair," Johanne Lizotte said, fighting tears. "I didn't feel good (seeing her like that), I can tell you that."